The scientific name of the tea plant is 'tea cinencis'. According to the method of manufacture it becomes black tea, oolong tea or green tea. Among tea plants there are various kinds that are suitable for different teas, the large-leaf type being suitable for black tea and the small-leaf type being suitable for green tea and so on. The tea plant was originally an evergreen which was seen as an underbush of the camphor tree, oak tree, camellia and so on, but before long tea plantations were established, making it easy to pick the leaves. Many of them are like the ones in Shizuoka which are laid out in ridges, making it easy to harvest the leaves by machine. Tea plants bud in April and these new leaves are harvested to make shincha (new tea). Then in about July the plants bud again and the tea from these leaves is called nibancha (second tea). Leaves harvested later than this are harder and of lower quality. Because they are harvested late they are called bancha (lit. evening tea). Also, when the new buds come out, covers are put over the tea plants to block direct sunlight, causing the plants to produce more chlorophyll in order to absorb as much light as possible. This produces soft, large and sweet leaves. 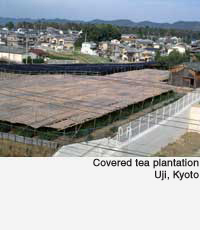 Tea which is grown under cover like this is used for gyokuro(refined green tea) and matcha (powdered green tea).